Leif Segerstam's 151st Symphony (eat your heart out Alan Hovhaness) was premiered last week by the estimable BBC Scottish Symphony Orchestra with the composer conducting. The single movement symphony lasts for less than half an hour, and Segerstam's programme note cites the recent outbreaks of bird flu as one of the inspirations for the symphony. Leif Segerstam, seen in my header photo, is one of those musical mavericks who are a dying breed in today's world of 'Mahler cycle before you are 30' agent controlled music making. (And yes, I know he has recorded a Mahler cycle). 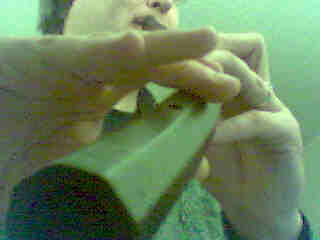 Segerstram's students include Susanna Mälkki, and he has used aleatoric techniques and has written for conductorless ensembles. He has championed music by contemporary composers including John Corigliano and Christopher Rouse, and fellow Finn Einojuhani Rautavaara. Rautavaara's music became fashionable in the mid-1990s, and I have several of his works in my CD collection dating from that time. Segerstam's recording of Rautavaara's Seventh Symphony (Angel of Light) plays as I write. I haven't listened to it for ten years, and coming back to it I find it deserving, beautifully crafted but ultimately unremarkable music that lacks any real sense of development - am I missing something? Judge Leif Segerstam's 151st Symphony for yourself. It is being broadcast on BBC Radio 3 this evening (Jan 24) and will be available for a week on demand after broadcast, or so the BBC says. 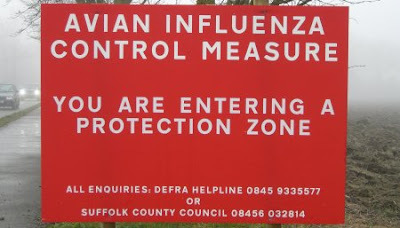 The photo below comes from my February 2007 article about the bird flu outbreak here in East Anglia. I never thought I'd be able to back link to it from a piece on contemporary music. Thank you Leif Segerstam for making it possible. Nice to hear about this performance. I've been keeping track of profligate symphonists for some time on my blog (see: http://renewablemusic.blogspot.com/2007/04/profligate-symphonists.html ). Curiously, or maybe not-so-curiously, nobody has been able to report a performance of any of Rowan Taylor's 265 symphonies, although some of his work was well-known in the Mormon musical community. 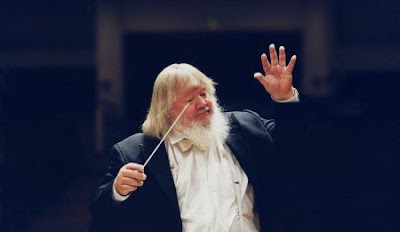 worth knowing that Segerstam, when in Vilnius about 4 or 5 years ago, was only on his 65th symphony. The one he played (not 65) was a vast work involving a huge orchestra and a piano each at the back of the first fiddles and the back of the celli, with Segerstam at one of them and another pianist at the other one. The poor (but oh so good) concertmaster meantime had to hold the band together, getting them all to finish together by jumping up. Thanks VV. I understand that Leif Segerstam has actually composed 189 symphonies! We can probably expect #191 any day now!